Offering a location steps from the water the non-smoking Point Loma Inn and Suites is a value-priced option where our guests might even catch a glimpse of the whales during their stay. The two-story boutique-style Point Loma Inn and Suites offers seven non-smoking rooms and seven non-smoking suites. 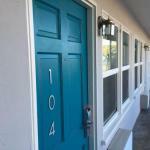 All accommodations feature plush beds microwaves mini-fridges Wi-Fi and cable TVs with premium channels. This family-friendly inn offers a Kid Suite with discount tickets to SeaWorld and San Diego Zoo. There's a 24-hour diner next to the property and many seafood restaurants along the coastline. Point Loma Inn is two miles from San Diego International Airport and Cabrillo National Monument and three miles from SeaWorld Midway District and Old Town San Diego. Animal lovers won't want to miss the San Diego Zoo eight miles away.